Here’s a first look at the latest Ride of the Week, the 2013 Toyota RAV4 XLE fwd. Compact SUVs and crossovers like the RAV4 are right-sized. They’re big enough to be practical but small enough to be fuel-efficient and easy to drive and park. In fact, shoppers in the mid-size sedan category should consider a smaller, 5-passenger SUV as well. For about the same money, these vehicles offer a few advantages over a four-door car. The Toyota RAV4’s airy interior, for example, is made possible by its taller roofline. Even rear-seat headroom is ample for adults, and reclining rear seats help backseat passengers get comfortable. And in the front seats, the RAV4 feels bigger than it really is. Many drivers will like the more upright seating position that a taller roofline affords, compared to the extended-leg seating position typical for sedans. Versatile cargo space is a huge benefit of compact SUVs like the RAV4. Compared to the mid-size Toyota Camry, for example, the RAV4 offers more than twice the cargo space. Fold down the split rear seats in the RAV4 and you get 5 times the cargo space of the Camry’s trunk. Roof rails extend potential cargo-carrying locations to outside the vehicle. With a standard 2.5-liter 4-cylinder engine, the 2013 Toyota RAV4 is fuel efficient, but not quite as thrifty as the Camry, especially on the highway. The front-wheel drive version is rated at 24 mpg city and 31 mpg highway, 1 mpg and 4 mpg less than the 4-cylinder Camry. Still, RAV4 fuel economy is strong, and real-world driving reflects that the EPA estimates are accurate. Plus, the 2.5-liter engine is plenty powerful and nicely matched to the 6-speed, providing a nice balance of power and efficiency. 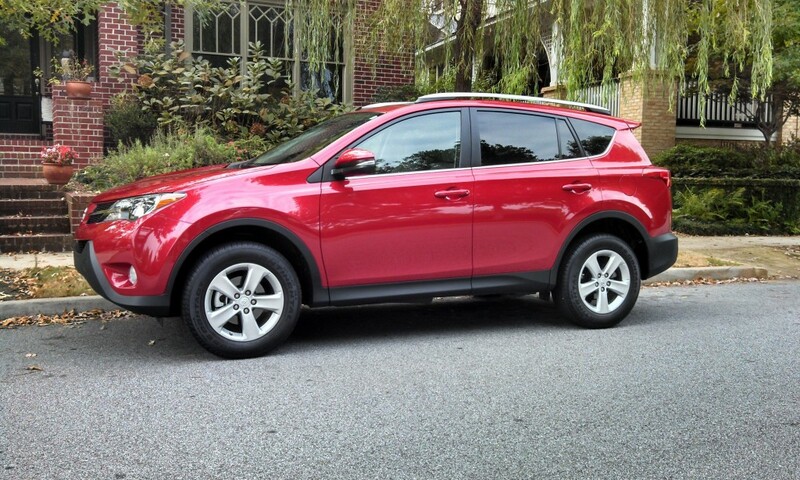 Choosing all-wheel drive for the RAV4 drops the fuel economy by 2 mpg for both city and highway ratings. That may be worthwhile for buyers in colder climates or those who prefer the improved traction of all-wheel drive for safety. The availability of all-wheel drive represents another advantage of compact crossovers over mid-size sedans. All-wheel drive is not available on the Camry, Honda Accord, Hyundai Sonata or Nissan Altima. But it is available on the RAV4, Honda CR-V, Hyundai Santa Fe Sport and Nissan Rogue. The 2013 RAV4 starts at $24,160 including destination charge for the base LE. That’s about $1,000 more than a base Toyota Camry. 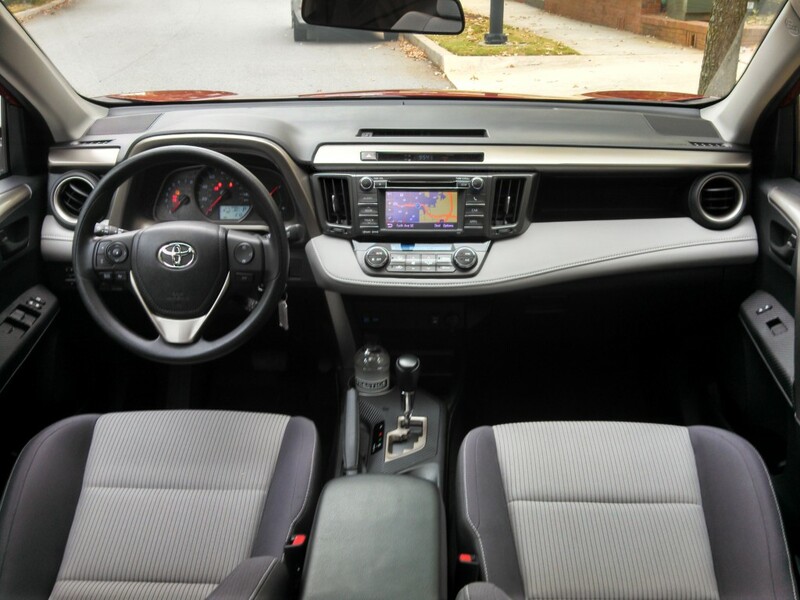 The 2013 Toyota RAV4 XLE fwd test car comes in at $26,165 including destination charge. That includes $1,030 for the optional Entune audio system.